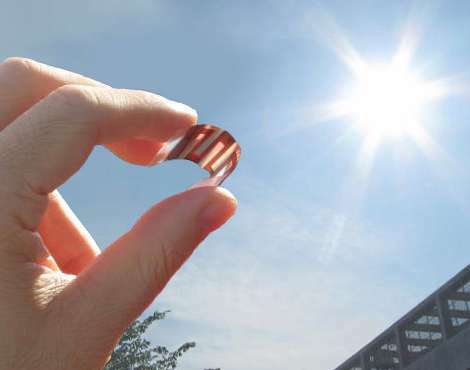 Organic photovoltaic cells—a type of solar cell that uses polymeric materials to capture sunlight—show tremendous promise as energy conversion devices, thanks to key attributes such as flexibility and low-cost production. The two types the team uses are photo-induced spectroscopy to determine the change in absorption after femtosecond photo-pulse excitation, and electrochemical spectroscopy to examine the absorption change due to charge injection. "By qualitative analysis of the spectral change, we can deduce how many charges are produced by one photon—its charge formation efficiency," said Professor Yutaka Moritomo, Institute of Materials Science at the University of Tsukuba. Just how significant is this? It's a huge step forward, said Moritomo, and the team also discovered that the charge formation efficiency remains high (0.55) even at low temperatures (80 K). "This was extremely surprising," Moritomo said, since the positive and negative charges are strongly bound in an organic photovoltaic device as an exciton—a bound state of an electron and hole, which are attracted to each other by the electrostatic Coulomb force. "Its charge formation was believed to be too difficult without a thermal activation process," explained Moritomo. "But our work shows that the charge formation process of an organic photovoltaic device is purely quantum mechanical, and any theoretical model should explain the high charge formation efficiency at low temperatures." The team's work will enable the high-throughput screening of organic materials for new organic photovoltaic devices. "Organic materials have several requirements—including high charge formation efficiency and high charge transport efficiency—so our method can be used to quickly screen the materials by charge formation efficiency," Moritomo said. Next for the team? "Now that we have a method to determine the key physical parameter, charge formation efficiency, we're exploring the interrelation between it and the nanoscale structure of the organic photovoltaic device to clarify the mechanism of the charge formation," noted Moritomo.